600+ pages is a MASSIVE read for me compared to my usual bookish haunts, but Jim Butcher made every single one of them count. 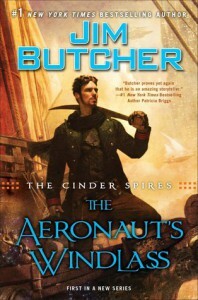 His trademark Harry Dresden humour was mostly absent (unless you're a cat person); however, if you're in the market for epic airship shoot outs, Steampunk-ish gadgets / beasties, and kickass story telling, THE AERONAUT'S WINDLASS is where it's at. Full review to follow.